A tool created as a collaboration between NYU's Marron Institute of Urban Management and the American Thoracic Society (ATS) exposes annual health impacts for air pollution concentrations that exceed standards. The tool is called Health of the Air and can be found here: www.healthoftheair.org. Speck and CREATE Lab are located in Pittsburgh, PA, so that's exactly what we searched for here. You can type your city name or zip code to see a report from your area. 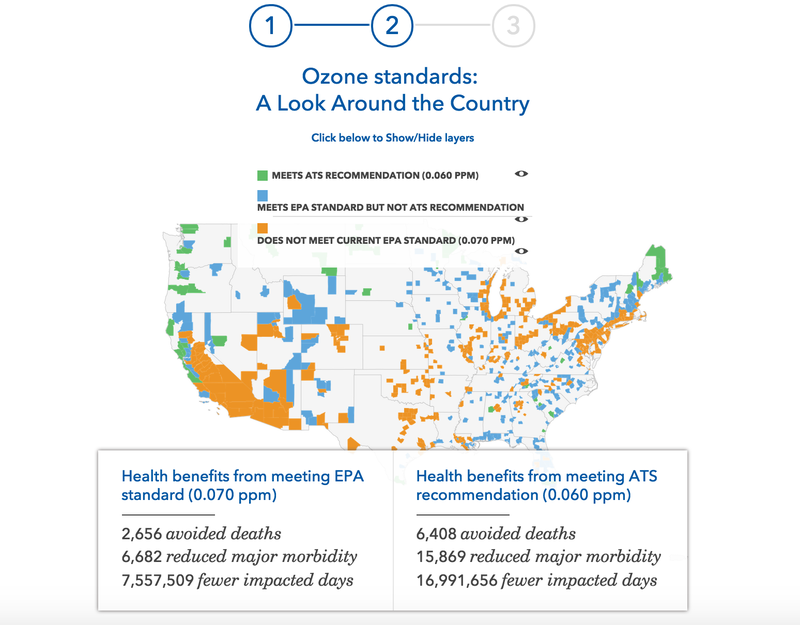 Health of the Air displays 3 screens of results based on ATS standards- the first are local impacts, second are ozone standards across the country, and third lists the cities that would benefit the most from moving to ATS standards. Immediate results for Pittsburgh yield that we are not meeting EPA standards for particle pollution or ozone. 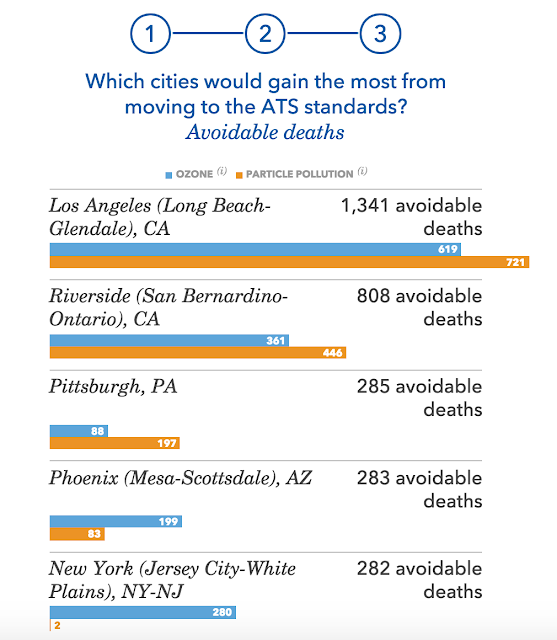 In terms of particle pollution (which is what the Speck measures) in Pittsburgh, ATS has estimated 197/285 deaths last year. Further, a whopping 331 incidents of heart attack, chronic bronchitis, hospital admissions (cardiovascular and respiratory), and emergency department visits (respiratory) were estimated. Come on, people! Note here that Pittsburgh is in the orange / does not meet EPA standards area at the southwest corner of PA. Ugh. Pittsburgh ranks #3 on the overall list! Avoidable deaths is an opportunity for change. Giving community members access to free tools such as Health of the Air is the first step in promoting fluency in data analysis and influencing positive change. InSPECKtion Series: Specks traveling from Florida to Peru! You have made me one happy camper ! I found your low cost, air quality monitor (the SPECK sensor), to help resolve a health issue that was bothering me for years. I was having problems with allergies and asthma in South America. I travel between Florida and Lima, Peru every 6 months. In my travels to Peru I've been having problems breathing at night, not being sure about the causes. I suspected possible air contamination (pollution), and since we live with 2 poodles, dog allergies. I read up about your air quality monitor and decided to purchase the SPECK sensor before my next trip to Peru. In Florida the readings were all good to start with (12-18ug/m3), but then I started upgrading my central A/C filters from Merv 4 to Merv 7 and noticed the improvement in air quality indoors (8-12 ug/m3). Next I'm going to try a Merv 13 filter to see if it's worth the additional cost. I also noticed spikes in the readings whenever I used underarm sprays, was cooking, or burning incense. I no longer burn incense. The SPECK sensor measures the air particles down to PM 2.5 microns. Those are the worst air particles because much of it is absorbed into the lungs. The WHO and EPA set the acceptable levels of air quality of 25 ug/m3 average in 24 hours. So I was happy in Florida and even thou the weather was cool and the humidity high (the same conditions I had in Peru), I did not suffer any breathing issues at night. I even shut off the a/c for a week and left the windows open and still didn't have any problems. In Peru it was a different story. As soon as I got to Peru I plugged in the SPECK sensor and it starting reading above 50 on average and at times it jumped to 70 ug/m3, almost 3 times the EPA’s acceptable levels ! I just so happened to bring a Merv 13 air filter with me and used it on the back of a cheap floor fan I purchased locally. With my bedroom doors and windows shut (we have no a/c in Lima) it brought those hi levels down to around 20 within an hour. It has been 5 months already and I am still free of allergies and asthma problems. All I can say is hallelujah ! NOTE: Imagine if I brought a HEPA filter with me instead. Another reason I bought the SPECK sensor was because of the Dashboard database that keeps your data in the form of graphs on the internet. I am able to compare the air quality hourly, daily, weekly, monthly, or even yearly. It allows me to see the graph representations between Florida and Peru. It also allows you to see the data in different measurements, and also records the temperature, which was a nice bonus! I don't know what more I can add of this excellent air quality monitor. It is small, portable, affordable, efficient, effective, and has helped me resolve an important issue in my life concerning my health. I am constantly learning about other issues that could effect the air quality where I travel, where I sleep, and where I live. What more can one ask for. It's an excellent tool for the times we live in. I also believe that young kids with growing lungs, people with low immune systems, and the elderly need to be aware of the air quality indoors; for it is well know that the air quality indoors is often worse than the air quality outdoors, and for that I recommend the SPECK sensor.